Since 1999 the German Centre Beijing, which supports small and medium-sized German companies in opening or expanding their bases in China, has been located in Beijing's Landmark Towers. 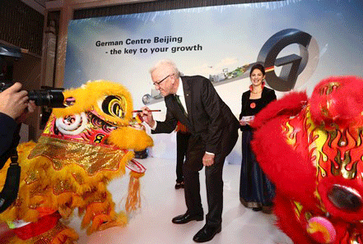 In October 2015 the German Centre Beijing celebrated the opening of its second building in DRC Liangmaqiao Diplomatic Office Building. Landesbank Baden­Württemberg and the German Centre Beijing celebrated the expansion of the new business center on the occasion of the visit of the Minister­ President of the State of Baden­Württemberg, Mr. Winfried Kretschmann, and the Deputy Minister­ President and Minister of Finance and Economics of the State of Baden­ Württemberg, Dr. Nils Schmid. Our executive search team in Beijing participated in the opening ceremony to celebrate the expansion together with the German business community in China.